I would like to start by thanking everyone for the well wishes, prayers and happy thoughts! It has been a hard few days but all your wonderful comments wishing me a quick recovery are so appreciated. One advantage to my mobility setback was the chance to catch up on a lot of blog visiting and working through my DVR. I had quite a few shows to catch up on before the new season starts. My knee is much better, still a bit swollen but I can hobble along. In other news, I am sure you have all been hearing about the Colorado floods. It is incredibly sad to see some of my beloved mountain towns destroyed by the wrath of Mother Nature. The little towns of Lyons and Estes Park that we love to visit regularly, and walk their main streets and poke about in the stores, are under water. It is heart breaking to see the destruction. My most beloved Rocky Mountain National Park is closed to visitors right now. For us, the way to get to Rocky Mountain National park is through the towns of Lyons and Estes Park. The roads to and from these towns are washed away. Never would I have imagined that I would see hurricane type rain and flooding in landlocked Colorado. I have been in a hurricane (IKE 2008) and the rain I experienced there is what I saw here the last 2 days. We were fortunate that we not affected by the flood or were at any risk of high water. There was a lot of rain and standing water, but our house is safe and so are we. I wish I could say the same about my friend who lives in Boulder who woke up to water in her basement. Thankfully, it stayed in the basement and didn’t rise any higher but it has been hard work for her to keep it pumped out and on top of it. My children happened to have rain days and were home for two days. It was nice to not have to bare the storm to get them from school and since my knee was also feeling a little better, I decided to break into my box of peaches. Ever since the rain started, it has been chilly and overcast here, a perfect time to make ice cream 🙂 Honestly, I just had to make ice cream. My ice cream bowls have been in my freezer the minute summer reared its head, but nothing has emerged. I simply had to make at least one ice cream before autumn rolls around; feels like it’s almost here. The salted caramel sauce is optional. My husband loves caramel sauce so I made the sauce for him to drizzle on top. Peach is a delicate flavour so if you want to taste the peach ice cream, you can omit the caramel sauce or just go easy on it. He said he liked it both ways, with and without the sauce. a delicate and luscious ice cream made with Colorado peaches and drizzled with a Pink Himalayan salted caramel sauce. In a medium saucepan, add the milk and cream and gently bring up to almost boiling. In a large bowl, add the egg yolks and sugar and beat together to mix. Once the milk comes up to a boil, add it slowly to the bowl with the egg yolks and sugar mixing well as you drizzle the milk in. Do not add to quickly or you will have scrambled eggs. Once the milk is added and incorporated with the egg yolks, add the mixture back into the saucepan. On medium low heat, heat the custard until thick and coats a spoon. Stir continuously and do not let it boil. 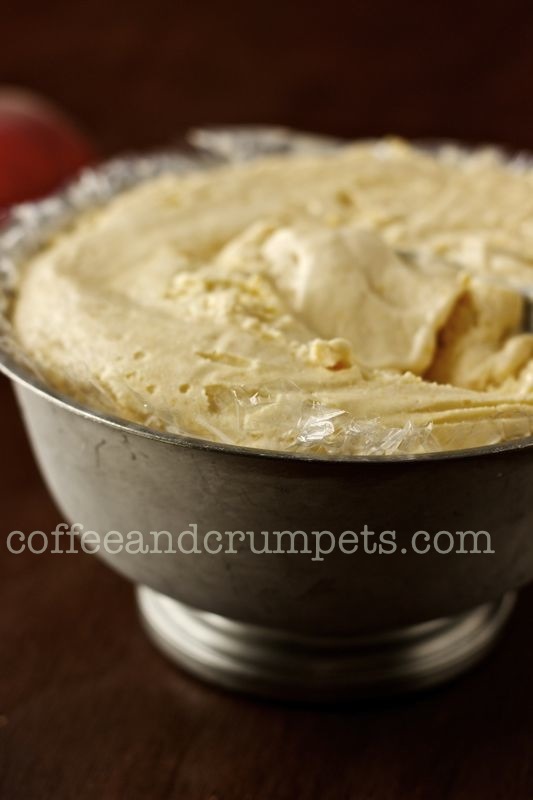 Once thickened pour through a fine sieve into a bowl and chill until cool before pouring into ice cream maker. While the custard is chilling, make the peach puree that will be added into the custard. Place the chopped peaches into a food processor and pulse until almost a puree. Add the peach puree and the sugar to a small saucepan and heat on medium heat until thick and jammy. This will take about 15-20 minutes. You want about a cup or so of cooked peach puree. Let the peach puree cool. Once the custard is chilled and the peach puree is cool, combine the two together to make a peach custard base for the ice cream. 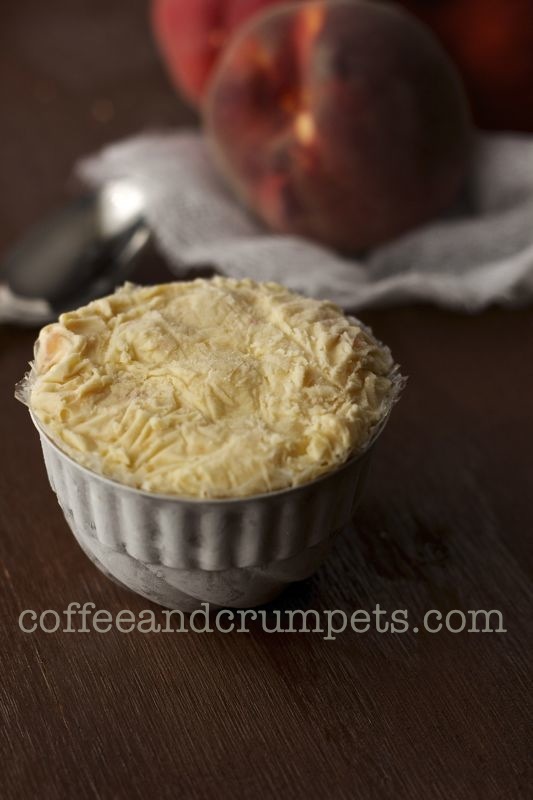 Pour the peach custard into the bowl of a chilled ice cream maker and follow the instructions for your ice cream maker. It will take about 20 minutes for the ice cream to churn and then scoop out into a storage container to freeze the ice cream until serving time. In a small sauce pan, add the sugar and water and heat on medium. Let the sugar melt and allow it to turn an amber colour. This will take some time, about 10-15 minutes. Watch carefully as the sugar can go from amber to burnt in seconds. Heat the cream in a small pitcher in the microwave and add the sea salt. 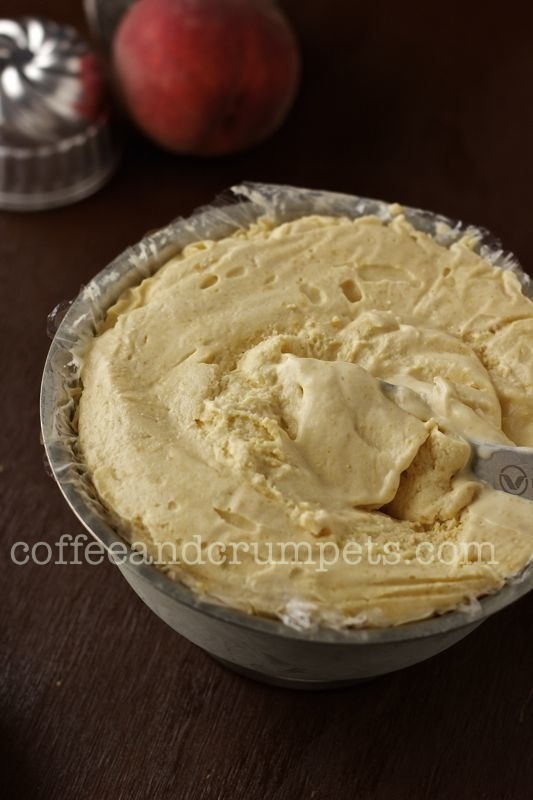 Once the sugar turns a golden amber colour, add the cream carefully, it will splutter. Mix off heat until all the sugar is melted and he cream is incorporated. Pour into a heat proof jar and allow to cool. Pour on ice cream before serving if desired. You could stir through some caramel into the ice cream, if desired. I left it on the side since my children don't all like caramel on their ice cream. The caramel sauce can also be used on other cakes, cookies and bread pudding. Store in the fridge. Hope you are all having a great weekend! We are just hoping to stay dry. Water can devastated and I’m hoping there’s no further damage. Please rest up and relax. Hope you’ll feel better soon..
Beautiful peach ice cream. And that caramel sauce is just so divine!! Thank you Nami, I appreciate your best wishes! It happens my dear! I usually read them when they pop up in my inbox but then forget to go to the site and comment! What awesome ice cream and I think Colorado peaches have been the best I’ve had in years. Can’t get enough of them. Thanks for visiting my blog. Let’s get together one of these days! Thanks Abbe! The peaches have been awesome and I’m sad they’re done. I ma glad to have found you and we must get together soon! Thanks so much for stopping by my blog and the comment. Always fun to find a fellow Colorado Blogger. I’m a new follower here and look forward to getting to know you. And oh-my this ice cream looks wonderful. And your photos beautiful. Dear Nazneen, I’m so glad to hear that you’re feeling much better and that you’re able to get some much needed rest through this. I know you are kinda forced to do so but isn’t it nice catching up on all your fav shows? Mother nature has been extremely unhappy lately. I’m glad to hear that your house and family are unaffected. Jealous that it’s starting to feel like fall over there. I’ve been treating myself to ice cream everyday…I know it sounds strange but I thoroughly enjoy eating it during the cold winter months as well! My husband would LOVE the caramel sauce as well! Hope you have a wonderful week, Nazneen! Thanks Min! I love ice cream anytime and find myself eating it more during winter! Thank you Harini, and welcome! It’s nice to have you here. Thank you for your lovely comment. Heavenly ! New follower here ! Am awestruck by your pics ! Thank you Shree! Thanks for your kind comment and welcome! I look forward to seeing you around. Lol. Not so sure that I’m an expert, but I do know a little about how difficult it is to forecast flooding, and that building cities in floodplains isn’t a great idea. Funny that! Glad to read that you’re doing better, Nazneen, and that the flooding has not affected you, your family, or home. I’ve visited a number of the towns impacted by the flood waters and it’s just so hard to believe. I hope this storm is the last for sometime, giving the area a chance to dry out. 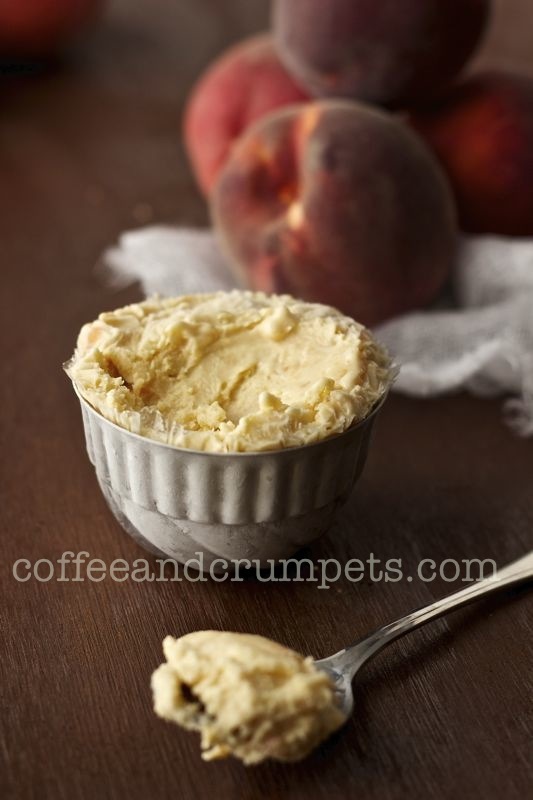 Your peach ice cream recipe sounds delicious, very creamy on the palate. I bet that salted caramel sauce is wonderful drizzled on top of a scoop — just like in your photo. A great pairing. Thanks John. It’s very sad about these towns. So much destruction. We are lucky that we were saved from this craziness. The ice cream turned out really well but didn’t last long at all! Water can be so destructive! I’ve experienced both hurricanes and flash floods, and neither one is a joke. Sorry to hear about Lyons and Estes Park – I love that part of the world. Anyway, lovely recipe! We’re still getting great peaches, so this definitely is something we should make. Thanks so much. Thanks John! It’s very sad what has happened to these towns. I hope they can recover soon. Thanks for your comment, John. How can I say to those flavors, yes please I’ll have a huge bowl:). Glad you are doing better, take some rest. Hopefully the rains will not damage more..it is of course very sad. Thank you Asha for your lovely comment and reassuring words. I really appreciate the thoughtfulness. What beautiful pictures, Nazneen! 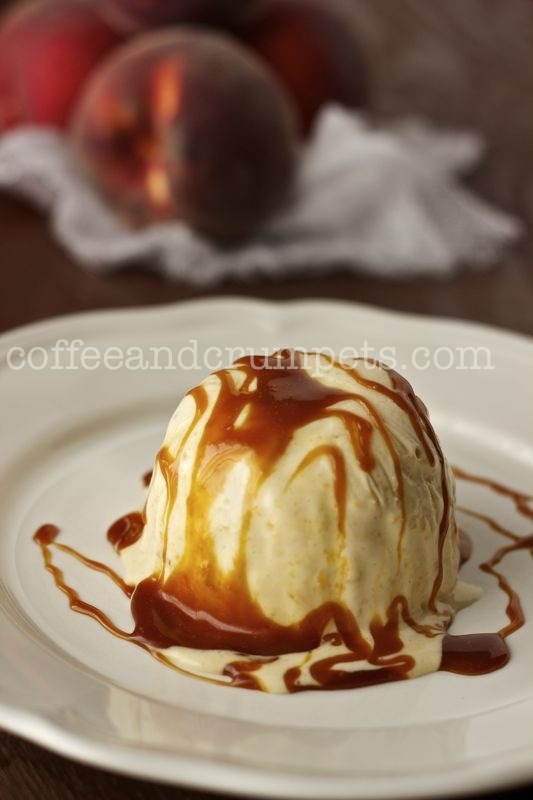 The plated peach ice cream drizzled with the caramel sauce looks so inviting. I am devouring it with the eyes…Have a great weekend! Denise Browning@From Brazil To You recently posted..Cuca de Maçã (Apple Crumb Cake) — Looking Forward to Autumn! Nazneen I have a peach tree in my home, I have only made crisp, chutneys, salad, occasionally a cake and the rest go to friends and neighbours. The ice cream idea sounds like an interesting way to use up few of my leftover peaches. Lucky you Bal! The peach ice cream is awesome! Very delicate flavour but nice and fruity. I think you’ll like it. Hi GG. Thanks! The cups are actually, I believe, individual jelly moulds or bundt cake pans. I found them at the thrift store but don’t think they are that old. Thanks so much Taruna for your well wishes. I really appreciate your kindness. I think ice cream and salted caramel sauce can’t fail to make anyone smile. Looks great. David Crichton recently posted..Imam Bayildi with Scallop Tortellini. I am so glad you are feeling better Nazneen. And not at all happy at the flood situation. We have friends there too, and while they are OK, their extended family is not and one of my friend’s rental is completely destroyed. The peach ice cream looks awesome!! Yummmmmm!!!!!! Thanks Minnie. I am sorry about your friends, it’s been very hard here and just devastating for so many. Keep us in your prayers. Thanks cquek! It is deliciously melty! I am so glad to hear that you are starting to mend. I’m sure a bit of ice cream helps with that :). If you have too many peaches, maybe you can try slicing them and freezing them. Then maybe you can use them as you want for baking or blending into smoothies or something. Hope you continue to recover. Have a wonderful weekend. Thanks Heavenly! I was thinking about freezing them if I can’t eat them all in time! But I really want to make stuff with them while in season.